Poutine is a dish consisting of French fries topped with fresh cheese curd, covered with brown gravy and sometimes additional ingredients. Left: Beef gravy on French fried potatoes and fresh cheese curds. Poutine is a diner staple which originated in Quebec and can now be found across Canada. It is sold by fast food chains in small "greasy spoon" type diners (commonly known as "cantines" or "casse-croûtes" in Quebec) and pubs, as well as by roadside chip wagons. 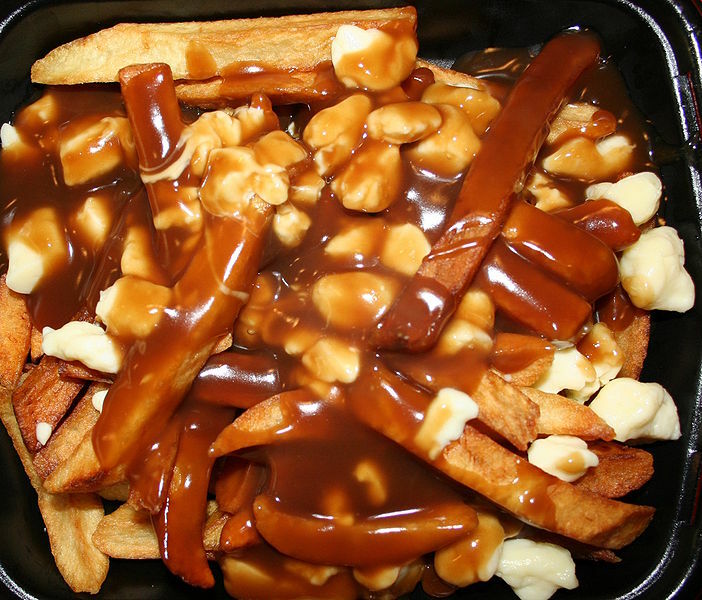 International chains like McDonald's, KFC and Burger King also sell mass-produced poutine in Canada. Along with fries and pizza, poutine is a very common dish sold and eaten in high school cafeterias in various parts of Canada. The dish originated in rural Quebec, Canada, in the late 1950s. The French fries are of medium thickness, and fried so that the insides are still soft, with an outer crust. The gravy is a light chicken, veal or turkey gravy, mildly spiced with a hint of pepper. Heavy beef or pork-based brown gravies are typically not used. Fresh cheese curd (not more than a day old) is used. To maintain the texture of the fries, the cheese curd and gravy must be added immediately prior to serving the dish.